CONCRETE RAIN WATER COLLECTION & STORAGE TANKS OF CAPACITY 6000 LITRES IN MUKONO , KIGOMBYA ZONE PLUS POTABLE WATER TESTING KITS TECHNOLOGIES TRAINING AND PROMOTION INCLUDING SOLAR WATER PASTUERIZATION TECHNIQUES. TARGET BENEFICIARIES : 250 POOR SPECIAL NEEDS KIDS AT LOCATION IN MUKONOTOWN COUNCIL AND 50 HOUSEHOLDS IN WAKISO NANSANA TOWN COUNCIL. Mukono Women’s Aids Task Force (MWATF) is a Women Development Organization Based in Maternity Village, Mukono Town Council in Mukono District. The Organization was Established in Oct 27th, 1997 with the views of helping women who are single mothers, needy women and children, people living with HIV /AIDS (PLWHAs), youth, people with disability (PWD), elderly and environment protection. The major aim is to improve and develop the standards of living, spiritually, socially, economically, and culturally. To achieve the above, women meet regularly to share ideas, and life experiences, advise and counsel each other, contribute and meet financial needs, utilize the technical knowledge, skills and talents they have to start and run project so far embarked on. MWATF started as a voluntary group of few people with the same views to help the needy and educate the masses about the dangers of HIV/AIDS, and environment protection. It originated when the outcry in the community sparked off the hearts of the Government Ministries to call upon all people to voluntarily come and sensitize HIV/AIDS, gender issues, environment protection programmes both in rural and urban areas of Mukono district and Wakiso. We first worked with religious leaders to distribute basics to orphans, single mothers, needy people and people with disability (PWD). MWATF works towards combating HIV/AIDS, STDs, Malaria, Cancer and other diseases that are the main causes of poverty and hunger and then to ensure environmental sustainability. •	Be a Forum for analysis, discussion and dissemination of information about existing HIV/AIDS, Gender issues, Malaria, STDs and other diseases, Environmental sustainability and other related economic policies. •	Link up groups, Network and the individual to share experience on the dangers of HIV/AIDS, Gender issues, poverty, hunger and environmental protection. •	To establish a basis over which widows, PLWHAs, single mothers, orphans and youth can attain a higher degree of reliance. •	Construction of saving energy Saving Stoves. •	Legal education and legal aid provisions. 48% Women and Girl Affairs. •	MWATF has distributed over 400 Mattresses to PLWHAs, orphans, needy children and women, people with disabilities and vulnerable children. •	Special Needs Education Centre establishment. •	MWATF has given 800 people counseling and guidance. •	MWATF has mobilized and organized 11 female youth self control clubs in 11 sub counties. 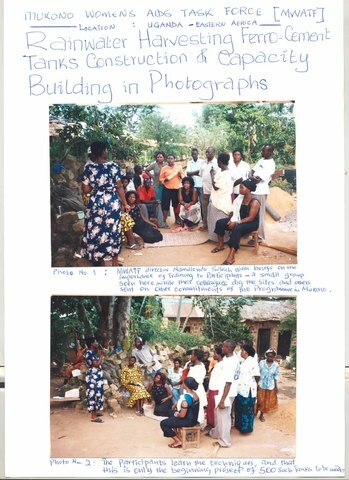 •	MWATF has managed to train 20 women groups in group formation. •	MWATF has mobilized and trained 28 People Living with HIV/AIDS groups. •	MWATF has distributed clothes to 800 PLWs, orphans, vulnerable women and children and people with disability. •	MWATF has distributed 50 boxes of Condom and Trained the Community how to use them. Getting Health Messages to the communities as well as telling the people to manage their lives and households well also means MWATF gets exposed to the families’ needs for clean, affordable and safe water and sanitation, needs among the poor, especially in rural areas and urban settlements. As a result, the organization became more involved in campaigns and activities for and about water supply and clean sanitation for all right from its early years of founding it mobilized the groups, talked to family heads, enlightened women, engaged children, worked hands- in -hands with schools and other institutions including collaboration with government agencies to provide both technical advice and modest material assistance towards sustained implementation of appropriate water supply solutions within its catchment areas. As in 2008, there have been ground breaking opportunities since MWATF engaged stakeholders at various levels and made it possible to deliver Boreholes, Hand-dug wells, improved water sources, stand alone water supply pipes, water kiosks among others to peri-Urban slums, let alone rural villages where MWATF taught and made headway to strengthen Rain water. WATER COLLECTION AND STORAGE FACILITIES. c)	Other Solid or Gaseous pollutants / contaminants. These often make them unfit to drink, thus the organization teaches communities to Boil the water first. Therefore, MWATF had found it necessary to advocate water filtration process and technology for use, which include its application by households that get their water from seasonal Pools, Rivers, Swamps or Lake which quite often may have human feaces contaminants. According to Mukono District Safe Water Coverage status Report (10th -03-2003) using the 2002 population and census Data, Mukono Town Council had approximately 50,000 inhabitants, 26,500 of which are Female 24,000 Male. (ii) MUKONO DISTRICT lies in the South East of Uganda about 22kms from Kampala City. It’s bordered by Jinja District in the East, Kayunga District in the North, Wakiso and Kampala Districts in the West and Lake Victoria in the South. Mukono District holds a population of 807,923. (By Housing Census – September 2002) Projected at 3.3% Growth rate. The District has four (4) counties namely; Mukono, Nakifuma, Buikwe and Buvuma (situated on Lake Victoria) comprising of over 85 Islands. There are 24 Sub counties, 4 Town Councils make up 28 Sub-Counties, 147 parishes and 1240 villages. The Water Problems faced differ from (a) Household status, as well as (b) Locations and the (c) Level of community enlightenment. a)	Well – to – do Households have enough money to construct innovative water supply units able to draw Ground Water or catch and store Rain Water. Poor Household rely only on available and nearest available water sources to fetch water for household needs – wells, swamps, rivers, lakes, boreholes. b)	Urban settlers may have access to piped water supply if they pay. Majority are poor, don’t have water supply connections, rain water harvest makes suitable answers in rainy season. c)	Enlightened community will protect water sources. d)	Rains /Draughts often makes water sources (Water Tables) to dry / lower. e)	Poverty of the general population makes it difficult to improve their access to better water and sanitation facilities. The Technology MWATF wants to implement is FERO-CEMENT RAINWATER HARVESTING & STORAGE TANKS. a)	Village – Level Water Management Committees of 5 persons who liaise with the organization and local residence. b)	There are Two (2) Technical Water Persons at MWATF who act as Trainer of Trainers [TOTs]. c)	Furthermore, MWATF had a chance to send two more trainers to get trained in the African Women’s Water Conference in Nairobi – Kenya (June 31 – July 5, 2008) who bought more expertise. MUKONO WOMEN AIDS TASK FORCE MWATF BUDGET. 50 HOMES EACH COMPRIZE 5 MEMBERS EQUALS (THUS) 50 x5 =250 OUT OF WHICH 30 ARE SINGLE MOTHERS, 10 ARE PEOPLE LIVING WITH HIV/AIDS, 20 ARE WIDOWS, 16 ARE ORPHANS, 8 ARE PERSONS WITH DISABILITIES. TRINING, INTERRACTIONS, EMPOWERMENT, SUPPLY OF MATERIALS, TRANSPORTERS, CIVIL LEADERS AND JOB OPPORTUNITIES, MASSS MEDIA, FREELANCE PHOTOGRAPHERS. RAINWATER HARVESTING FERRO-CEMENT TANK WILL BE CONSTRUCTED CAPACITY 6000 LITERS TO DEMONSTRATE TO PUBLIC HOW INEXPENSIVE IT IS YET DURABLE BUT NOT KNOWN, COULD SUPPORT FAMILIES IN GETTING WATER REDUCING LONGDISTANCE WALK TO FETCH OFTEN POLLUTED WATER FOR HUMAN CONSUMPTION AND OTHER USAGE, FIRST PHASES PROVED SUCCESSFUL, PEOPLE WERE EXCITED, YET RESOURCES ARE FEW, MWATF SEEKS ASSISTANCE TO BUILD 400 FERRO-CEMMENT TANKS IN NEXT 3 YEARS IN UGANDAS CENTRAL DISTRICTS OF WAKISO, MUKONO, RAKAI AND KIBOGA, BESIDES UNDERGROUND SAME TANKS, OTHERS WITH SUBMERSIBLE PUMPS DRAWING WATER FROM BOREHOLES, THEN SPRINGWELLS, BESIDES OTHERS, THERE ARE 500 PIT LATRINES CONSTRUCTION NEEDS FOR SCHOOLS, LANDING SITES, TRADING CENTERS, ROADSIDE MARKETS, ORPHARNAGES AND SCHOOLS, AS WELL AS SOLAR WATER PASTEURAZITION AND SOLAR COOKERS PROMOTION, SOLAR LIGHTING FACILITIES AND SOLAR WATER PUMPS FOR RURAL AREAS AND REMOTE INSTITUTIONAL INSTALLATIONS AS HEALTHCENTERS AND SCHOOLS. ALREADY MWATF OPERATE THROUGH LOCALLY FUNCTIONING VILLAGE AND DISTRICT, SUBCOUNTY AND COUNTY GROUPS AS PARTNERS AND LEAD AGENCIES, VILLAGE COUNCILS AND ZONAL AUTHORITIES . UGANDA GOVERNMENT THROUGH ITS VARIOUS AGENCIES HAVE GIVEN BLESSINGS AND SUPPORT AND THERE ARE GREEN LIGHTS AND PERMISSION TO LIAISE AND HELP THEM DELIVER SERVICE TO POPULATION. MWATFs PORTFOLIO HAVE SINCE INCLUDED COUNSELLING THE FAMILIES AND INDIVIDUALS INFECTED AND AFFECTED WITH HIV/AIDS, PROVIDING PSYCHO-SOCIAL SUPPORT, MOBILIZING WOMEN AND YOUTH FOR DEVELOPMENT PROJECTS, ADVOCACY AND LOBBY, HANDICRAFTS PRODUCTION, ALL WILL CONTINUE AS PART OF THIS PROJECT, PARTICULARILY TREEPLANTING FOR CONSERVATION AND INCOMES, PART OF MWATFS ENVIRONMENTAL CONSERVATION, ENERGY SAVING STOVE PRODUCTION AND PROMOTION IS PART OF MWATFS OVERALL GOALS NOW WILL BE MORE EXPANDED AND CONSOLIDATED. SKILLS BUILDING AS VOCATIONAL LIFESKILLS DEVELOPMENT WILL BE CONSOLIDATED, PLUS ENTREPRENEURSHIP IN WATER AND RELATED SERVICES. Great to have you back on PWX! Your project is aimed to serve "250 POOR SPECIAL NEEDS KIDS AT LOCATION IN MUKONOTOWN COUNCIL," but the details of the background and their need are missing. What is this location? Why do the children need the storage tank? What is their current water source? Also, what is the current water source for the 50 HOUSEHOLDS in Wakiso Nansana? KIGOMBYA LOCATION in Mukono is particularily Water Stressed, residents trave upto 3 kilometres to fetch Water from Swamps and occassional Water Pools shared by Livestock-Goats, Cattle, Pigs, among others thus the Water is polluted, Children equally waste lots of precious time Collecting the Water instead of going to Schools, equally parents and Guardians fear Child Sacrifice common in the Uganda these Days whereby several Kids are abducted and found Dead by Traditional Healers and Devil Worshipers, the Project is good for the Community. How many ferro-cement water storage tanks will you construct in this project? Your proposal mentions building one for 6,000 liters but the budget is for a 15,000 liter tank. Please specify. Three(3 units) of 6000 Litres Tanks shall be constructed in Kigombya Village, this is intended to Benefit Hommes of People Living With HIV/AIDS and Orphans among others. How to Guarantee Rain Water is Safe? From what you report, earlier rainwater harvesting resulted in unclean water. Do you plan to use the PML to test the water once it's in the ferro-cement tank? Will you be encouraging people to try solar pasteurization rather than boiling the water, having to use more scarce wood resources? Do you think there will be enough water caught to serve the needs of 250 kids? What is their water source now? THE First FERROCEMENT TANK was successfully built, however the cost was much higher than originally budgetted for we then had to immediately mobilize local resources to meet the goal. We used the Solar Pasteurization of the Water technologies to demonstrate with amazing results, this time we intend to fully promote it for wider usage, we are working out proposal for the POTABLE SOLAR WATER TESTING KIT and expect to promote this technology at higher more sustainable levels in Uganda. -In the section Background/Need on page 2, there is very minimal discussion of the community where the project is going to be done. The general comments about possible residents makes it seem like the organization has no relationship with the community and is not talking about anyone real. -Would prefer mention of specific work done in the community in the past. -General details about the organization should absolutely not be in the application - that's what the organizational profile is for on PWX. The lists of staff and volunteers make the application look very unprofessional. -Think the application is missing a specific plan of action. -How are maintenance costs going to add up to $3000 for a project that costs $1000? Why is there no plan included? As a second project funded through PWX, I would have hoped to see a stronger application because the organization is already familiar with the proposal and this process. MWATF has experience in building ferro-cement tanks, and their pilot project was successful. I am encouraged that they are promoting solar pasteurization and will use the PML to show how the condition of water is improved by their interventions. They have big ambitions and seem to be going step by step. It seems like they use their resources wisely. They also practice the "each one, teach one" idea of expecting trained people to go back home and train others. I wish them success!! !